Arthur G. O'Leary MD, of Montgomery, NY, passed away Tuesday, December 4, 2018, at his home in Crawford with his wife at his bedside. He was 93. Born on March 29, 1925 in Newburgh, he was the son of the late Daniel I. O'Leary MD and Lucy Allgair O'Leary. He was the husband of Catherine Curley O'Leary, to whom he was married for 64 years. 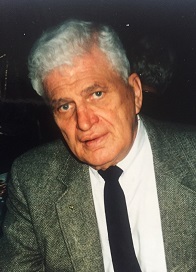 Arthur was a graduate of NFA, class of 1943, in Newburgh and of Manhattan College, class of 1946, in NYC and of NYS Medical School, class of 1950 in Brooklyn. He interned at Kings County Hospital 1950 to 1952 in Brooklyn, NY. He served in the U.S. Army Medical Corps in the 25th Division during the Korean War as a Battalion Surgeon,1952 to 1954 and was awarded the Silver and Bronze Stars as well as two Purple Hearts. After his marriage in 1954, Arthur opened his office in New Windsor and conducted a General Practice of Medicine for over 60 years. He was affiliated with both St. Lukes and Cornwall Hospitals. He was a long-time parishioner of St. Francis Catholic Church in Newburgh and of Holy Name of Mary Church after he moved to Montgomery, NY 12 years ago. Survivors include his wife Catherine at home; sister Peg Curran of Spring Lake Heights, NJ; brother-in-law Tom Curley and his wife Ann of Blakeslee, PA; sister-in-law Mary Curley of West Pittston, PA; brother-in-law Leo Dowd of Pittston, PA and many beloved nieces, nephews, great nieces and great nephews. In addition to his parents, he was preceded in death by his brother Daniel O'Leary, sister-in-law Stasia O'Leary and brother-in-law Jack Curran. Visitation will be Monday, December 10, 2018, 9:30-11:30 am. at Millspaugh Funeral Home, 22 Bank St., Walden, NY 12586. A Mass of Christian Burial will be celebrated at 12:30 PM, Monday, December 10, 2018, at Holy Name of Mary Church, 89 Union St., Montgomery, NY.